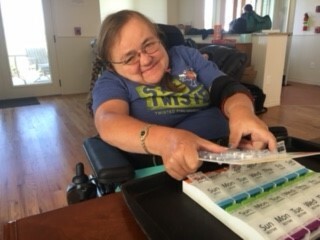 This week's Tech Tuesday takes us to Imagine!’s Santa Fe Group Home in Broomfield, where Donna has joined a group of individuals working on medication self-reliance by using a computer-based medication tracking system designed by Imagine! staff members. Here she is, filling her medication reminder box for the first time. Keep up the great work, Donna! To learn more about the medication tracking system Donna is using, check out the short video below about Donna’s friend Lana.